Railpictures.ca - A.W.Mooney Photo: Going thru negatives I found another example of a series of detour trains, one example of which I posted a few years ago (#14254). Work was being done on CN mainline (Grimsby Sub) Bridge 6 over the Welland Canal,and as far as I can recall the bridge was shut down for work at regular times daily. Hopefully the morning freights as well as Amtrak would make it thru beforehand. But sometimes the autoparts train from Talbotville to Buffalo would be late. So the alternative was to take the Thorold Sub, accessed at mile 9.49 where the old Merritton Station was, and this route would take the traffic into Port Robinson. Actually a short cut, but unfortunately this line traversed probably the steeped grade in Canada en route to Bridge 10, where it crossed the canal between Thorold S and Allanburg. I managed to catch this train just a few times in a period between 11/27/96 and late January 1997. 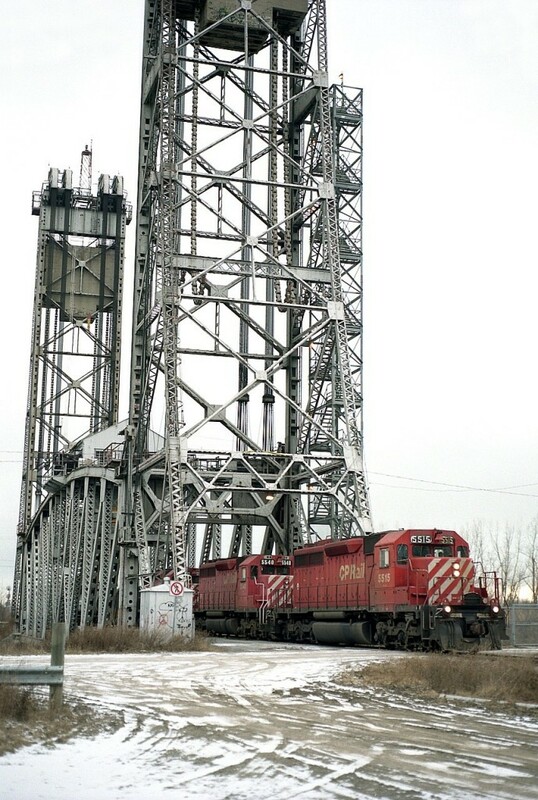 Once maintenance was done on Bridge 6, then bridge 10 was declared redundant and dismantled. It has been over 20 years since it came down. In this photo #328 is just crossing the bridge and coming up to Hayes Rd, where the line turns south and crosses Hwy 20 and into Port Rob. I believe the trackage north of Hwy 20 is now out of service as the Pulp and Paper Mill and Hayes Dana among other industries have all closed down. Power on this train is CP 5515, 5540 and 5526; all straight SD40s and all now off the roster. | Railpictures.ca – Canadian Railway Photography – photographie ferroviaire Canadienne. Caption: Going thru negatives I found another example of a series of detour trains, one example of which I posted a few years ago (#14254). Work was being done on CN mainline (Grimsby Sub) Bridge 6 over the Welland Canal,and as far as I can recall the bridge was shut down for work at regular times daily. Hopefully the morning freights as well as Amtrak would make it thru beforehand. But sometimes the autoparts train from Talbotville to Buffalo would be late. So the alternative was to take the Thorold Sub, accessed at mile 9.49 where the old Merritton Station was, and this route would take the traffic into Port Robinson. Actually a short cut, but unfortunately this line traversed probably the steeped grade in Canada en route to Bridge 10, where it crossed the canal between Thorold S and Allanburg. I managed to catch this train just a few times in a period between 11/27/96 and late January 1997. Once maintenance was done on Bridge 6, then bridge 10 was declared redundant and dismantled. It has been over 20 years since it came down. In this photo #328 is just crossing the bridge and coming up to Hayes Rd, where the line turns south and crosses Hwy 20 and into Port Rob. I believe the trackage north of Hwy 20 is now out of service as the Pulp and Paper Mill and Hayes Dana among other industries have all closed down. Power on this train is CP 5515, 5540 and 5526; all straight SD40s and all now off the roster. Ah I see, the linked photo of QOPC-2 was what I was thinking of when I said black unit, I forgot about 1324 in there. By the way Arnold, love this. This is the holy grail for me – NS detours on other CN tracks! I would imagine the onus to remove these bridges was manual control? Did they have an operator to man them? Hence a salary to maintain.. and other expenses – these bridges would have been built approx 1930 so quite old by this point. See comments in this photo. Three…I remember the RFP green unit, there was a black one. What was the third? I wonder if those two switchers are still at te paper mill.